The red shows unconfirmed combined sewer overflows. 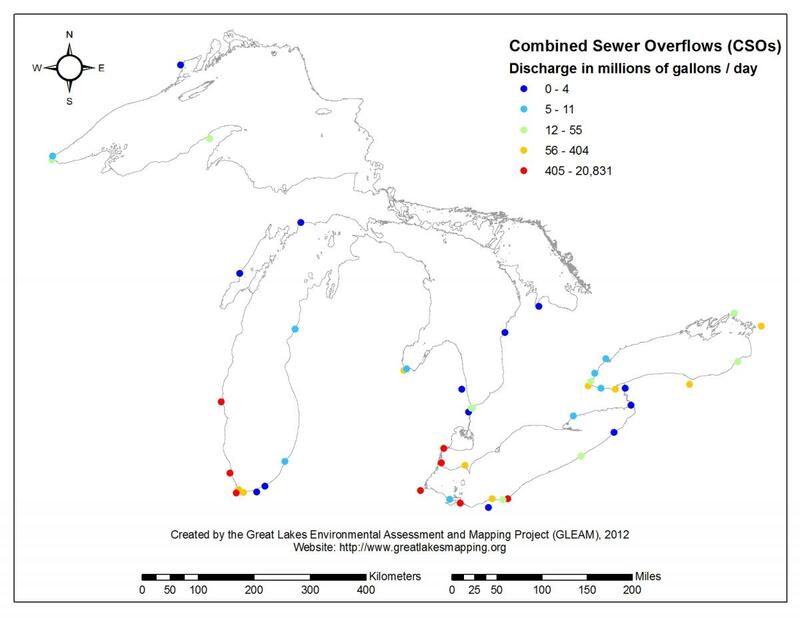 Combined sewer overflows across the Great Lakes. Inundated by nearly 5 inches of rain in less than 36 hours, Chicago water officials have had to "re-reverse" the flow of the Chicago River, opening the large gates that separate Lake Michigan from the river to relieve pressure on a sewer system swollen with runoff and waste. 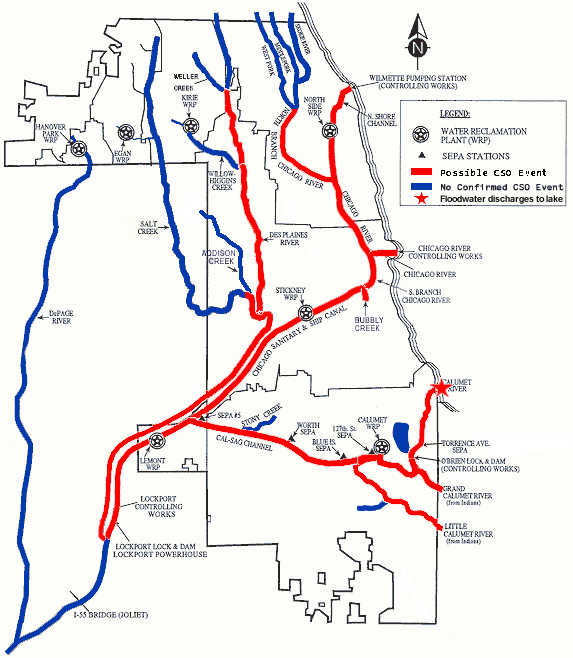 As Chicago Magazine’s Whet Moser reported, the deluge has easily outpaced recent upgrades to the city&apos;s water and sewage infrastructure. Michael Hawthorne of the Chicago Tribune reported in 2011 that Lake Michigan had been hit with more sewage in recent years than the previous two decades combined. The Metropolitan Wastewater Reclamation District said Thursday that its 109-mile network of tunnels and reservoirs was 100 percent full. The Mainstream Tunnel was full by 12:31 a.m., while the Des Plaines Tunnel filled up at 3:30 a.m. Built to contain 2.3 billion gallons, the system hit capacity and poured enough stormwater and sewage into Chicago-area waterways to help raise their levels higher than Lake Michigan. Following protocol, MWRD tried to relieve some of that pressure by dumping the tainted water into the lake. Contaminants can spread kilometers away from shore. MWRD has asked residents to minimize their water use to help ease the strain on the heavily burdened system. Not that it&apos;s a great day for a swim, anyway, but you might not want to hit the beach, either. Chicago’s sewer problems may be stark, but they are not unique. A 2004 EPA report to Congress found Chicago’s overflows plagued mainly by bacteria, while the city of Toledo, Ohio suffered pollution from copper, lead, silver and zinc. Water samples taken near Toledo&apos;s sewer outfalls showed effects of chronic toxicity. A 2010 study by the National Wildlife Federation found cities around the Great Lakes discharged 41 billion gallons of untreated sewage and stormwater into the lakes in 2009, with Chicago and Detroit leading the way. There has been some progress. Detroit has decreased sewer overflows by 80 percent below 1995 levels by adding capacity, but had to back off its own deep tunnel project in 2009 due to lack of funding. Chicago’s waterways have cleared up, too, but face a murky future. The total number of fish species found in the Chicago and Calumet river system increased six-fold between 1974, around the time that MWRD upgraded their facilities, and 2001. But the Deep Tunnel project originally meant to help the system avoid overflows won’t be complete until 2029, and may still be inadequate in the face of floods pumped up by climate change.